43% think he can bring about change in the U.S.
WASHINGTON, D.C. -- For the first time, the percentage of Americans who credit Donald Trump with being a strong leader has fallen below the majority level, to 47%. At the same time, Americans' confidence in the president as an agent of change, a quality that helped him win the election, has edged down to 43%. Still, more Americans attribute these two qualities to Trump than three other positive characteristics: empathy, truthfulness and managing government effectively. Assessments of Trump's characteristics have been fairly static since April, tracking closely with his overall job approval rating. Shortly after Trump took office, Americans gave him relatively high ratings on two characteristics -- his leadership and his ability to bring about change. By April, Americans had begun to sour on the president's skill at effecting change, but he maintained majority support for his strong leadership until it fell below 50% for the first time this month. While readings for Trump's truthfulness (33%), management of government (37%) and empathy (40%) haven't fallen sharply in the past few months, they are down significantly from February. The latest readings are from an Aug. 2-6 Gallup poll, completed before two recent events dominated news coverage and resulted in widespread criticism of the president. Trump warned North Korea on Aug. 8 that threatening the U.S. would result in "fire and fury." And after a violent rally of white supremacists in Charlottesville, Virginia, on Aug. 12 that left three dead, the media and political leaders in both parties criticized Trump for not strongly condemning the white supremacists by name. It is unknown whether these recent events affected any perceptions of the character qualities tested Aug. 2-6. The trends show that in general, and historically, the public's views of personal characteristics edge down in sync with the president's overall job approval rating. 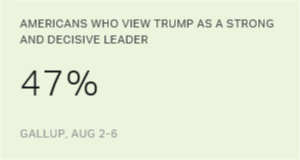 In Gallup Daily tracking conducted Aug. 12-14, Trump's job approval stood at 36% -- after hitting a new personal low in polling conducted Aug. 11-13. Despite tepid overall character ratings, more than eight in 10 Republicans consider Trump to be a strong leader, able to put the country's interests ahead of his own, a change agent and empathetic. Republicans are somewhat less positive in their ratings of his honesty and whether he can effectively manage government. Majorities in many of the groups that tended to vote for Trump -- men, whites, those without college degrees and those living in rural areas -- also still think he is a strong leader. Views of Trump's characteristics have trended downward in tandem with his approval ratings, but his greatest attributes -- strong and decisive leadership and the ability to bring about needed change -- remain his highest perceived strengths. Historically, attrition in a president's job approval rating is to be expected, yet presidents have typically started their first term in office in higher standing than Trump did. Shortly after his inauguration, Trump's job approval was 46%, but he has since been unable to maintain that rating, much less build on it. Results for this Gallup poll are based on telephone interviews conducted Aug. 2-6, 2017, with a random sample of 1,017 adults, aged 18 and older, living in all 50 U.S. states and the District of Columbia. For results based on the total sample of national adults, the margin of sampling error is ±4 percentage points at the 95% confidence level. President Trump's job approval rating is at 34% for the three-day period from Friday through Sunday -- by one point the lowest of his administration so far. One in four Americans believe Donald Trump acted illegally in his campaign's alleged involvement with Russian officials, similar to Americans' 1998 reactions to Bill Clinton's actions in the Whitewater and Lewinsky matters.